Skincare is such a personal thing and we all have our own issues to deal with on an everyday basis, which is why I decided to dedicate this week of posts to skincare only. I will be focusing on my experiences and products I currently use. Almost a month ago I showed you guys a sneak peak into my huge skincare overhaul from Boots, but didn't want to review anything until I had tried each and every product out for a few weeks. Now that I've done that, it's time to tell you all about my new & improved skincare routines. All throughout my teenage years I was lucky enough to have clear skin with very few problems. Even up to a few years back, the only main issue I had to deal with was dry skin, which is pretty simple as I knew I had to buy moisturising & hydrating products. My luck changed about a year ago as I was suddenly faced with combination skin and no clue as to how to go about dealing with it. When I say combination skin, I truly mean the two extremes, such as very dry cheeks/jaw area with quite oily t-zone/nose area and of course pesky little spots that like to tag along. Over the past year I have been trying out numerous products and changing my routine every few months to find what works best for my skin. Even now after a complete skincare overhaul, I still feel like I'm not 100% there yet with the perfect routines (who knows maybe I'll never get it right but regardless I feel like I've learned a lot about what my skin needs). This post will focus on my morning skincare routine which I make sure is simple & quick, as I just don't have the time to be focusing on something elaborate . These are all products that I'm trying out for the first time and have been using for a few weeks now. 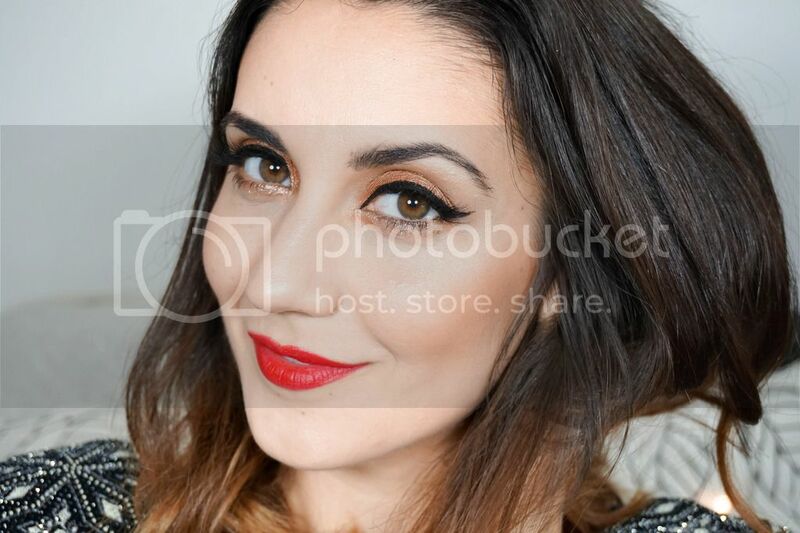 Firstly I like to take off all the grime & dirt build throughout the night, as my skin just feels so much cleaner. 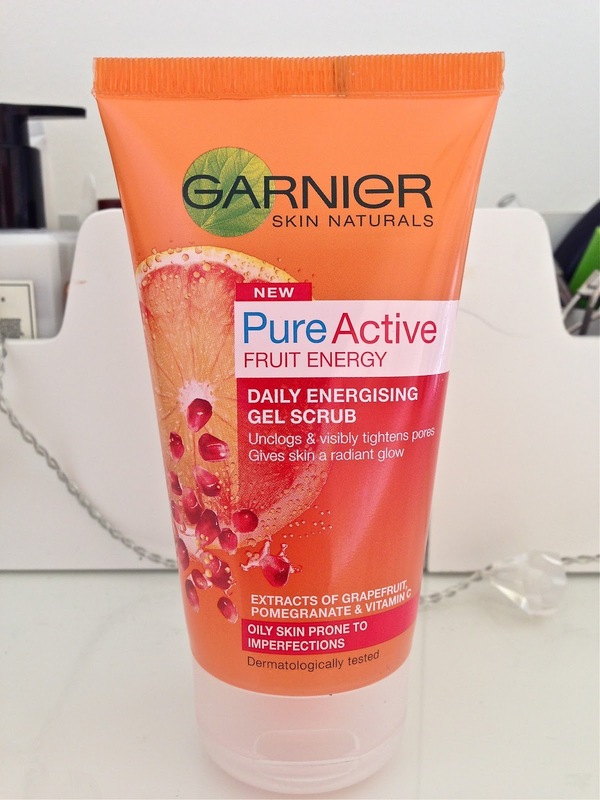 For my morning cleanser I picked out Garnier Pure Active Fruit Energy Daily Energising Gel Scrub (now that's a mouthful), as I wanted something quite refreshing & energising in the morning for that 'wake me up'. It is designed for oily skin so it can be a little drying on certain areas of the face but it hasn't had any bad effects on my skin and I absolutely love the fresh scent. I will continue to use this especially now while the weather is still warm but I doubt it will be a repurchase, because for the colder months my skin will definitely need something more hydrating. Next step is a quick spritz of toner, I never understood the whole point of using a toner until a few months ago but now it's always part of my routine and I quite enjoy it. 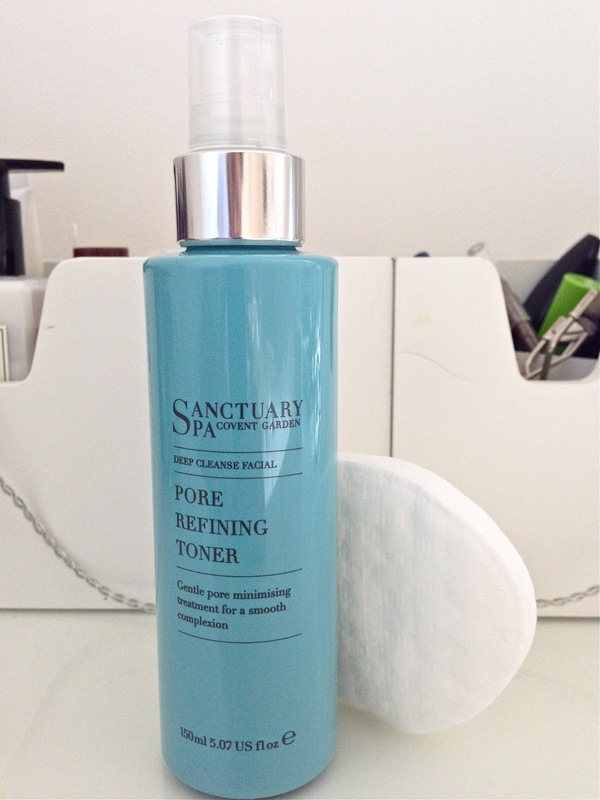 I picked up the Sanctuary Pore Refining Toner as I deal with quite large pores in my t-zone area (attractive I know). For this reason I only use 2/3 sprays of this and specifically point it to the problem areas. Instructions do say to spray it on a cotton pad & then apply it to the face, but I personally much prefer to apply it to the face directly and then dab a clean cotton pad over it. This feels cool & refreshing on the skin. However it's not magic and won't make pores completely shrink but it does help slightly. Last step in the routine is moisturising, something which I've always needed to use. 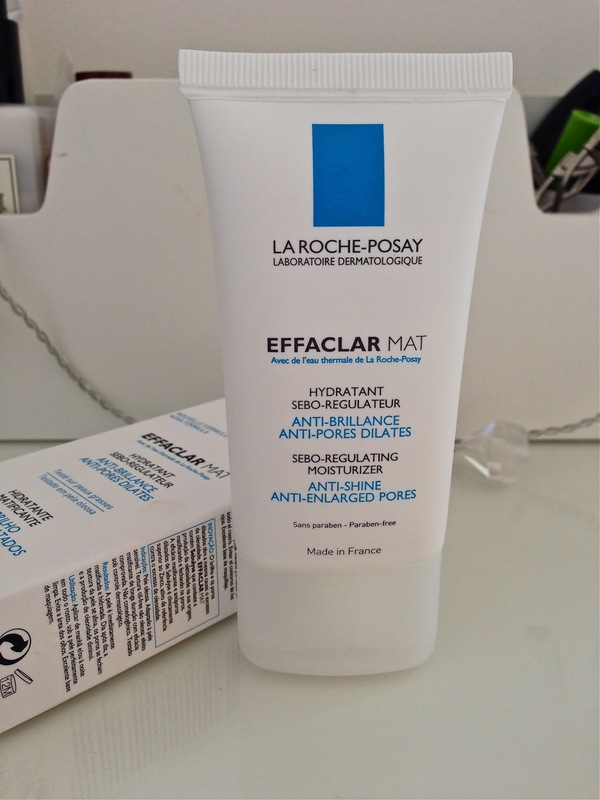 I chose the La Roche Posay Effaclar Matt as it seemed like the perfect solution to keep the shine at bay whilst hydrating the skin. It does a great job for my t-zone area, as it tightens pores and mattifies the oily parts. But of course the dryer areas of my face are throwing a tantrum because it's definitely not as hydrating as it claims to be, not for my skin anyway (I would imagine that if you do suffer with truly oily skin this would be a dream). Therefore I popped into The Body Shop seeking advice and leaving the store with two new skincare products. One of them is the Vitamin E Moisture Cream and the other I will share with you in my evening skincare routine. I use this first concentrating on the dryer areas and once this has been absorbed I use the Effaclar Matt to control the shine in my t-zone. I find that the Vitamin E cream keeps the dryer areas on my face perfectly hydrated whilst offering plenty of moisture. Yup I know my face is a total drama queen demanding that I use two different moisturisers, but if that's what keeps my skin happy then that's what I'll do. I have used the Sanctuary toner and it's really nice. That Body Shop Moisturizer sounds amazing! This is great inspiration! I love skin care products (i have quite the collection myself), but they are so necessary! I was going to do a skin care post, and this has definitely inspired me to go through with it. I will have to try some of those products! Yes, all throughout high school, I had little to no skin issues, but now that I am in college, I have been having the worst break outs (to me anyway). I have been trying different products and I don't really see fast results. Stress acne is hard to get rid of. I love The Body Shop's vitamin E range! Also, I really want to try that thermal mask in your top photo, i've never used a mask like it and am so intrigued! I love the Vitamin E moisturiser, the entire range is wonderful! I've never used a toner before, I might have to try one out! Agh, your skincare posts are putting me to shame! You think your morning routine is easy, mine is "apply moisturiser... probably". This is why I don't do skincare posts lol! But seriously, this has inspired me to get my act together, I guess with moving into winter now it's the perfect time to start putting a collection of stuff together.